Peabody Museum Connections – Costa Rica and Panama – James A. Doyle, Ph.D. This past week, some members of the Dumbarton Oaks catalog team (Colin, Juan Antonio, and myself) joined leading scholars in the field of Costa Rican archaeology for an objects-based workshop at the Peabody Museum of Archaeology and Ethnology at Harvard University. Special thanks go to everyone at Harvard for the gracious invitation, especially Jeffrey Quilter, Director, Steven LeBlanc, Director of Collections, David Schafer and all the collections staff, and Susan Haskell, curatorial associate. In addition to seeing excellent presentations by John Hoopes, Jeff Frost, and Francisco Corrales about Costa Rican Archaeology, we viewed many of the highlights from the Peabody’s superior collections of Central American materials. Our visit accomplished two main goals related to the catalog project: first explore comparative materials and iconography across multiple media; and second, find clues about the original contexts of many of the Dumbarton Oaks pieces. The DO Double-Figure Pendant (PC.B.319) bears similarities to Peabody 55-17-20/19738. A compelling detail of the Peabody piece is that the two figures carry three trophy heads between them. 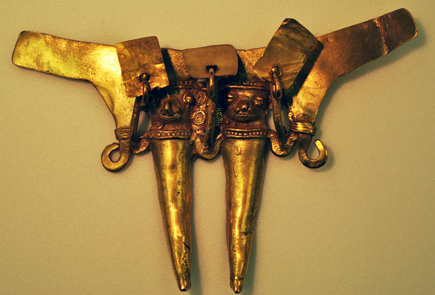 PC.B.319 – Double-Figure Pendant. Dumbarton Oaks Research Library and Collection. Several Peabody “Axe Gods” (e.g., 47-2-20/17481) have common iconographic elements and forms to the DO examples. A Costa Rican musician figure at the Peabody (31-42-20/C13726) is of similar scale and posture as some DO figures, such as PC.B.336 and PC.B.345 in the Veraguas style. 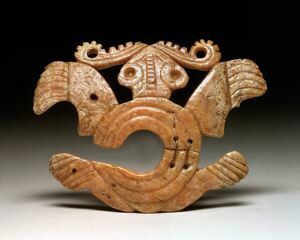 It also shares characteristics with the “Quimbaya style” figure, PC.B.374, which comes originally from the former Felix Wiss collection of San Jose, Costa Rica. PC.B.336, PC.B.345, and PC.B.374. Dumbarton Oaks Research Library and Collection. Many items from the Sitio Conte excavations at the Peabody have comparative pieces in the Dumbarton Oaks collection. Notably, a Spondylus shell turtle from the Dumbarton Oaks Collection acquired by Robert Bliss in 1951 (PC.B.391) that comes originally from the Peabody Museum, has a counterpart in gold from Sitio Conte, Peabody 30-49-20/C11082. PC.B.391 – Turtle Pendant. Dumbarton Oaks Research Library and Collection. The visit was a very productive beginning to the cross-institution cooperation and conversation that will continue as the momentum builds for investigations into Central American and Colombian materials. Notes from the Cenote | James A. Doyle, Ph.D.